The skeleton key is all the rage this year which is why we've created a favor that's on trend with our Vintage Skeleton Key Themed Key Chain. 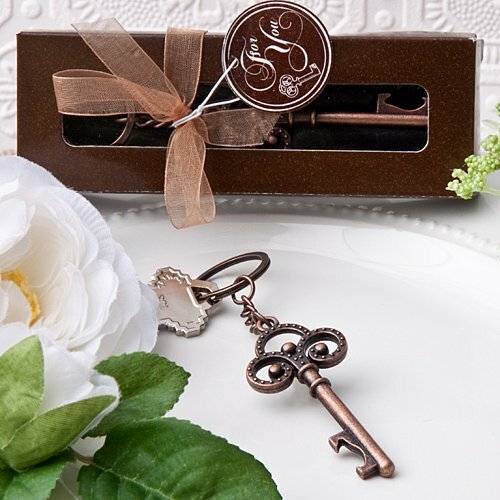 The functionality of the key chain will make these vintage party favors one your guests will love to use and remember your fun day each time they grab their keys! The copper colored metal key charm features details of a three ringed designed head with raised stud accents. It's presented in its own brown gift box with a clear window to view the gift inside. The box is wrapped and tied with a copper organza ribbon and an attached "For You" tag. Skeleton key charm measures 2 1/2" long x 1 1/4" wide (4 3/4" long with chain and ring). This is the Vintage Skeleton Key Bottle Opener by FashionCraft. It comes nicely packaged with a nice little ribbon and a little note for you on there. And you open it up, as you can see it's a bottle opener. It is copper colored with the intricate design here, and it's actually a perfect wedding favor since you can see it's a bottle opener and people use this pretty frequently in their daily lives. This is to ensure that your wedding guests will carry your memories with them everyday. Perfect wedding favor for that wedding of yours. Can you change the color ribbon? All of our favors are shipped exactly as shown and described on our site directly from the manufacturer. We do not and cannot alter them at all prior to shipping, consequently. I'm interested on that box vintage key but not for wedding its for the 60th birthday. Thanks for your interest. This Vintage Skeleton Key Bottle Opener is also a good favor not only for wedding but for birthday celebration as well. It comes nicely packaged with a nice little ribbon and a little note for you on there. And you open it up, as you can see it's a bottle opener. Hi, I wanted to know if the Vintage Skeleton Key Themed Key Chain is also a bottle opener? This Vintage Skeleton Key Themed Key Chain is a copper colored metal key charm, featuring details of a three ringed designed head with raised stud accents. It's also presented in its own brown gift box with a clear window to view the gift inside.